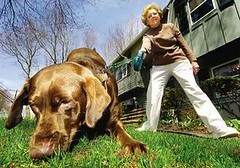 A chocolate Labrador, Lilly, is better than a metal detector or any kind of treasure finder. She sniffs out money. On a walk last week, Lilly stopped and sniffed out a young man’s wallet. Two years before, Lilly found a box full of $300 at a park. Lilly’s owner then has the task of finding who the money belongs to. I think we lost a few hundred dollars over there somewhere… next to a fat wallet. Keep on sniffing, Lilly. This entry was posted on Wednesday, May 9th, 2007 at 3:49 am	and is filed under Dogs, National Dog, Cat & Pet Info, News for Cats, Dogs & Owners. You can follow any responses to this entry through the RSS 2.0 feed. Both comments and pings are currently closed. Can I hire your dog to find hidden cash in my home that I cannot find? I will also like 2 hire your dog for the same reasons…. I desperately need your dog to find a misplaced sum of cash in my home. Please help. Looking to hire a Money-Sniffing dog. Please contact me with details as soon as possible at kg-rogers@hotmail.com We are located in Southern CA (Los Angeles). Thanks.